The widely praised debut from Turkish-French director Deniz Gamze Ergüven, from her original screenplay, traces the sexual and emotional coming of age of five orphaned sisters as they confront the joys and limitations of growing up in a conservative town in rural Turkey, searching for their own power in a series of dark and comedic events. Trailer for the film, which was France's submission for Best Foreign Language Film at this year's Oscars. 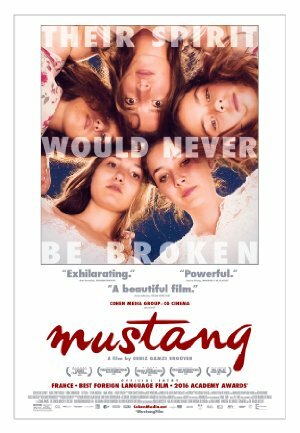 "Mustang is at once feisty, poetic, hilarious, and gut-wrenching. It’s like a feminist 400 Blows, or if the punk teens from We Are the Best! were cast in a remake of The Great Escape." Really loved this film. It's so deftly made I'm still astonished it's a first feature - a beautifully shot and tightly edited 90-minutes of insight into girlhood, sexuality, Turkish middle class society and so much more. The role Istanbul plays in one girl's hungry fantasies as a vision of escape from rigid patriarchy was even more poignant after the bombing this week. I also love the ending; it's not clear at all what's going to happen next but it's a perfect place to stop. Great, smart little movie. I LOVE THIS MOVIE. I can't recommend it highly enough. It's so much fun, and yet it's so serious and urgent at the same time. Just a perfect balancing act between despair and hope. That's it exactly - a powerful and wonderful balancing act, full of life and joy and understanding while also taking you to some very poignant and very dark places. Amazing debut film. What a fantastic film, glad I saw it on the big screen. Though I could hardly get out of my chair afterwards. What made Lale think her truck driver friend was gay though? (When she is phoning the numbers from the shopping bags, that's one of the ways she tries to identify him.) I must be missing some context there.